Clare Hudson examines a number of devices and applications designed to assist and develop technology skills for people with disabilities. For many people, devices such as iPods and iPads have become an extension of their arm. They give us so much at the touch of a screen. They keep us up-to-date on the everyday movements and special events of those who may not be in close proximity (or, in some cases, may be! ), and on news from around the world. They provide all sorts of on-the-spot entertainment from music to DVD, games to virtual worlds. And no matter what the issue or problem someone always knows of ‘an app for that!’ This development in the technological world has brought with it fantastic opportunities, particularly in the area of support and development of communication skills. There are so many options that it’s hard not to feel like the proverbial ‘kid in a candy store’ when we browse our ‘local’ app store (without even having to leave the house!) But the sheer volume of options can quickly become overwhelming and it can often be daunting to know where to start; how to know what you or your child would benefit most from, what type of devices and apps would be appropriate and how to begin using the app. This article aims to point you in a helpful direction with these decisions and dilemmas, discusses how technology can be used for social connection, and finishes with an example of how technology in the form of Skype has been used in an innovative way to connect and provide support for teenagers who stammer. Advances in technology have brought us a new vocabulary. I for one am guilty of using ‘techie words’ without really understanding what I’m saying, always to be caught out in the mobile phone shop when I realise I am unable to fully participate in the conversation I have started. So, I am going to provide a quick reminder of what I think I mean by a few ‘techie’ words that will be used in this article. ‘App’ is short for “application”, which refers to a software application or a software programme used on a smartphone or mobile device such as the Android, iPhone, iPad or iTouch. ‘Android’ is an operating system for mobile phones and tablets, in much the same way that PCs run Microsoft Windows as their operating system. It is maintained by Google. ‘Tablet’ refers to a tablet computer; a mobile computer with a touch screen display, circuitry and battery in a single device. iPad by Apple is a type of tablet device. Choosing technology: Where to start? Devices and apps are available to support education, leisure skills, communication, independent living, social skills and employment. Determine whether the focus is to support the individual’s language and communication skills, or to teach numeracy or literacy, or indeed to provide an activity in which the individual can engage independently for a period of time (e.g. a game or a film). Figure 1 outlines some of the areas of communication that can be supported and developed through the use of technology. *AAC: Alternative and Augmentative Communication includes all forms of communication (other than oral speech) that are used to express thoughts, needs, wants, and ideas. Voice Output Communication Aid (VOCA) is an aided AAC system as it is a device in addition to the users’ body. the capacity for language development. AAC users and communication partners (the person(s) with whom we communicate) benefit from support and training to use specific techniques and strategies to maximise the benefits and effectiveness of AAC. Likewise it is important to think about what the communication partner can do to support the user to use an app or technology to transition or complete a task more independently. On this website, apps are organised in sections relating to their general purpose (e.g. 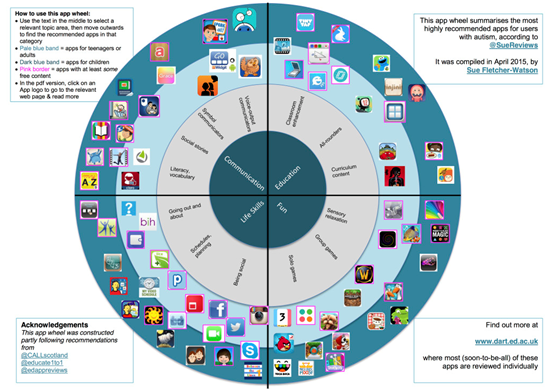 communication, education, fun, life skills) in an interactive ‘app wheel’ (last updated in April 2015, see Figure 2). The website allows the user to click on each app icon to find out more about the app. This website also publishes regular app reviews which aim to provide an evidence-based perspective on apps for autism. Figure 2: Interactive app wheel compiled by Sue Fletcher-Watson. For AAC, http://aactechconnect.com/wp-content/uploads/2011/07/Apps-SummarySummer-6.10-14..pdf provides a list of AAC apps, including information about key features of each app, which will help in discussions with the speech and language therapist as to an app that might best meet your AAC needs. Apps relating to the various areas of communication including language, speech, emotions, social communication and organisation are outlined in an easy to read table which includes the price and comments about the app. In my experience, many apps are regularly updated as a result of both user feedback and further advances in technology. An example of this is in visual schedule/organisation/social story apps. Where once these apps were personalised through use of photographs, they can now be personalised through use of video of the individual completing the task, or steps in the task. Planned use of videos is known as ‘Video Modelling’ and ‘Video Self-Modelling’ and have been found to be effective means of skill acquisition, maintenance and generalisation for individuals with ASD (Bellini & Akullian, 2007). Apps vary in price; some are free with others being relatively expensive. Many apps offer a ‘lite’ version, which is a free taster of the app and others offer a free trial period of the app. Trials and ‘lite’ versions can be a very effective part of the decision-making process to know if the app is the right one for you at the moment. In addition, there are a number of websites, blogs or forums on which parents and app users provide reviews and personal accounts of their use of the apps. Preparation: What is the rationale behind using an app versus using actual books/toys? Parameters: What is the appropriate amount of time for the child to spend using the device? Might the device interfere with naturally occurring communication at times? Purpose: What is the advertised purpose of the app? How can this app meet a child’s goals (by means of this purpose or using the app in an alternative way)? Positioning: How and where should you position the child and/or yourself to maximise interaction and communication? Playtime: How will you and your child experience shared enjoyment with the app? Potential: How will you extend and expand the learning gained from using an app to real-life experiences and to support future learning? For more information on “The 7 Ps”, see http://pampclub.org/site/2011/07/01/maximizing-mobile-technology-with-toddlers-preschoolers . – Use different coloured cases when using the device for different purposes. Social media such as Facebook and Twitter and online communities are increasingly used as a means of staying connected with friends and families, creating new relationships with like-minded individuals and exploring topics and dilemmas in an undisclosed manner. The face-to-face element of social communication can be eliminated in communication via technology. For some individuals for whom initiating and maintaining conversation can be a daunting task, social media can allow a greater sense of control over the conversation, more time to process what has been ‘said’ and what to ‘say’, and avoids the need to process the non-verbal messages that come with face-to-face interactions. Within the literature on the use of technology by individuals with ASD, the themes that emerge relate to the sense of empowerment and social connection experienced by people using technology as a medium for communication as well as the voice given to this community (Byrne, 2013; Davidson, 2008). “Technology doesn’t mean sitting alone in a darkened room any more, and the line between technology and ‘real life’ is disappearing” (NAS, 2015, www.autism.org.uk/technology). ‘Cyber safety’ is an important element of any online activity. It is critical that internet users are aware of the dangers that exist when talking online and learn to be cyber safe. Irish Stammering Association runs a monthly online support group for teenagers who stammer. The group aims to provide a place for teenagers who stammer from all over Ireland to meet, chat and share experiences online. The group uses Skype to connect to a video conversation. The group is facilitated by speech and language therapists but the young people discuss topics of interest to them. The group was established in early 2014 and members hail from various parts of the country. Feedback from members has been positive: “I get to talk to people and I don’t [need to] think about my speech”, “I’m going out of my comfort zone…it’s a good thing and helpful” and “the call reminds me about techniques”. As a group facilitator, I have enjoyed being part of the discussion on stammering and have been impressed by the willingness of people to share experiences and support each other. A variety of topics have been discussed ranging from stammering to X-Factor contenders, which allowed for a more free-flowing and fun conversation. I hope that more young people from different parts of the country will participate in upcoming groups and that they will be empowered from group support. Advances in technology have brought new opportunities to support, develop and enhance communication skills. This technology may be life-changing for some families but it is rarely the answer to all the communication needs of an individual. Communication is by definition an interactive process where messages are sent between a speaker and a listener. The listener is vital to the further development of communication skills, even with the addition of a device or app. Beukelman, D.R., & Mirenda, P. (2005) Augmentative and Alternative Communication; Supporting Children & Adults with Complex Communication Needs (3rd Edition) Baltimore: Paul H Brookes Publishing Co.
DeCurtis, L. L., & Ferrer, D. (2011). Integrating mobile technology using a family-focused approach. CSHA Magazine,41, 1, 10–11, 25. Clare Hudson is Speech and Language Therapy Manager at St Paul’s Hospital and Special School, Dublin.